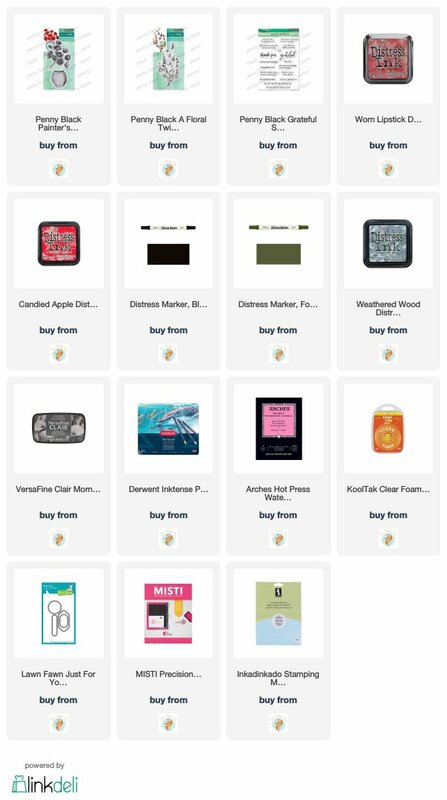 Are you a wee bit surprised to see a journal page here? I’m surprised myself, surprised but pleased. I really enjoyed dreaming it up and making it. It didn’t end up looking as I imagined but that is the way with journal pages is it not? 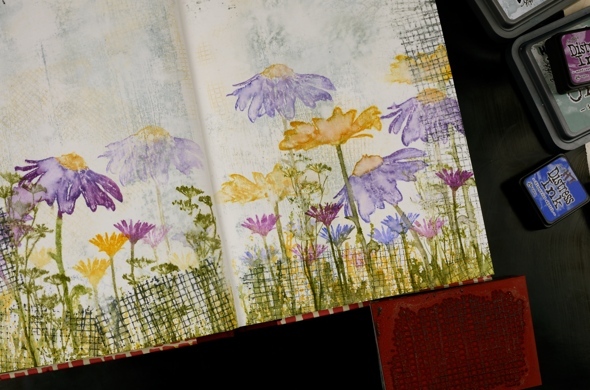 This art journal is a Fabriano journal; the paper is nice and thick but not watercolour paper so I painted over it with absorbent ground first. 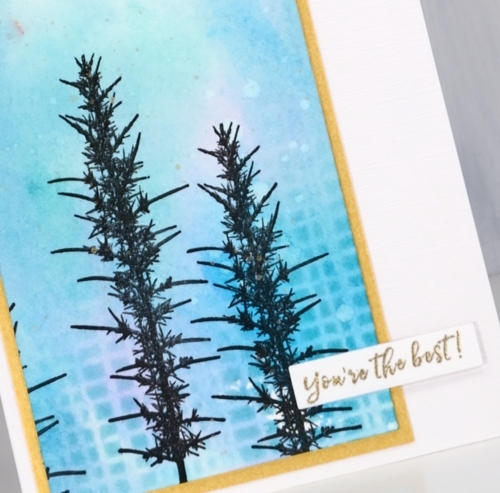 Then I grabbed a bunch of stamps from Darkroom Door along with three light coloured oxide inks and stamped mesh, stone and woodgrain texture stamps over the background. I spritzed it with water to soften the edges of the stamped images and dabbed some out too to make it subtler. Even after adding some water it was still bolder than I wanted so I painted another thin layer of absorbent ground over it. 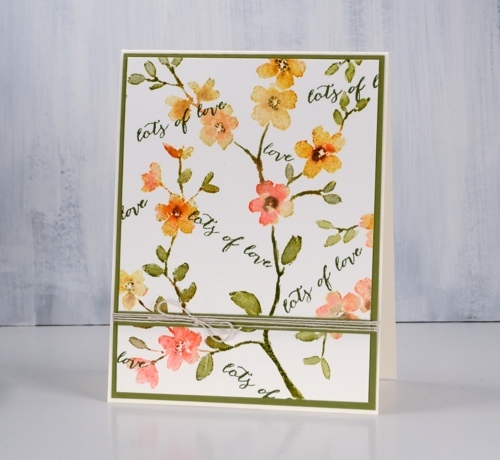 I filled the bottom of the page with repeat stampings of flowers from the Darkroom Door ‘tall flowers‘ set in distress inks then blended some of the big flowers with water. They don’t blend as well as they do on watercolour paper but the effect is still nice. 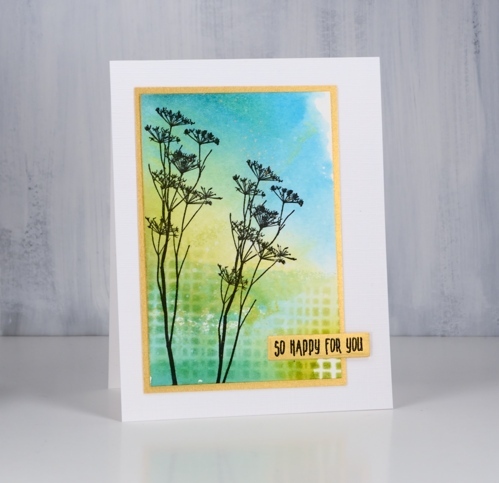 I added grass and flowers from the DD ‘ nature walk‘ set, also in distress ink then a border with the mesh texture stamp in black soot oxide ink. It was a bit bolder than I wanted so I spritzed then dabbed with a paper towel ( as you can see I’m a fan of the ‘spritz and dab’ ). 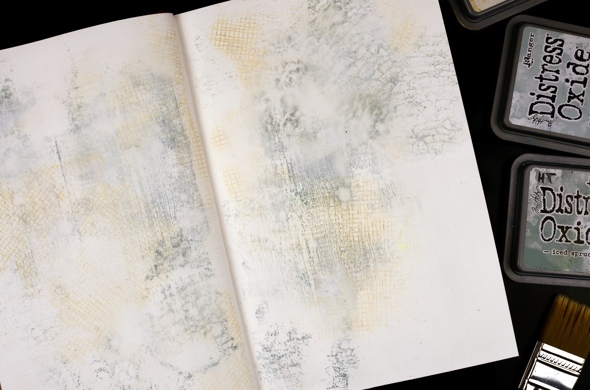 I splattered wild honey, forest moss and dusty concord diluted ink over the whole spread and it ended up looking like confetti. 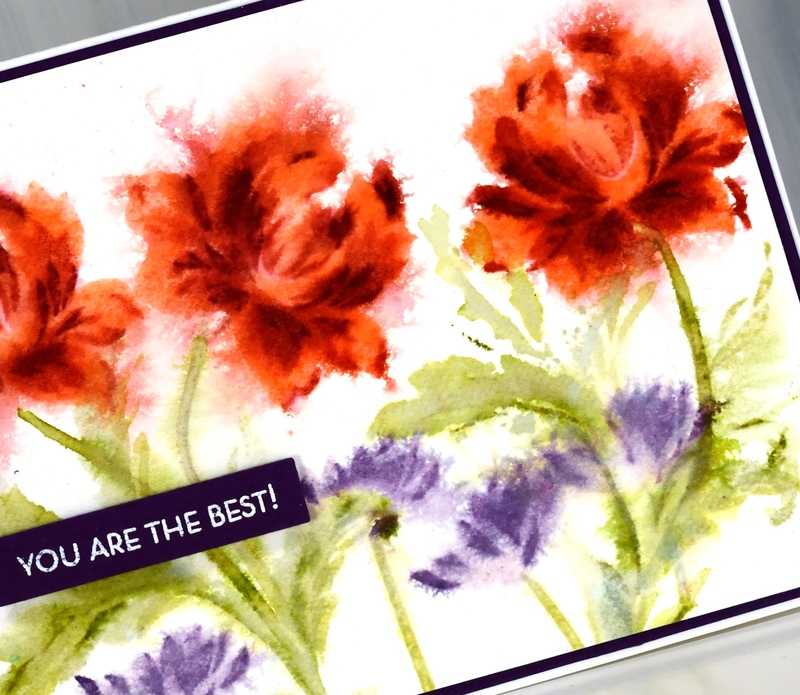 To boost a few of the flowers I outlined them with fine tipped black markers. I wrote psalm 18:36 with a brush pen leaving a space to stamp the word ‘steps’ with the DD alphabet medley stamps. 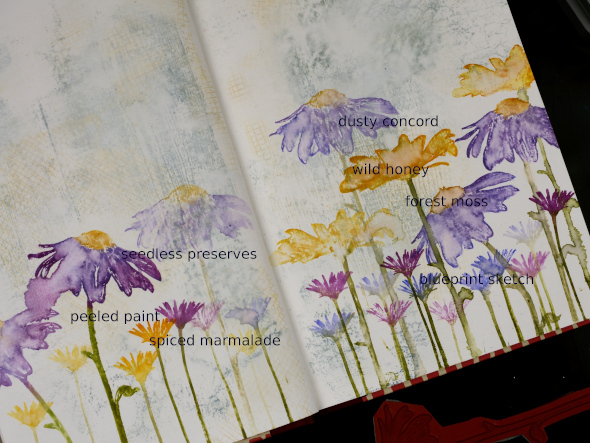 I find choosing words for a journal page tricky, which words and how to add them. 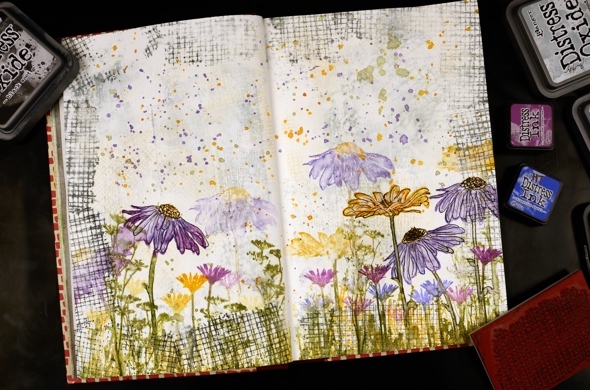 But the beauty of a journal page is the experimental nature of it. If I don’t like something on this page, I’ll try something different on another. 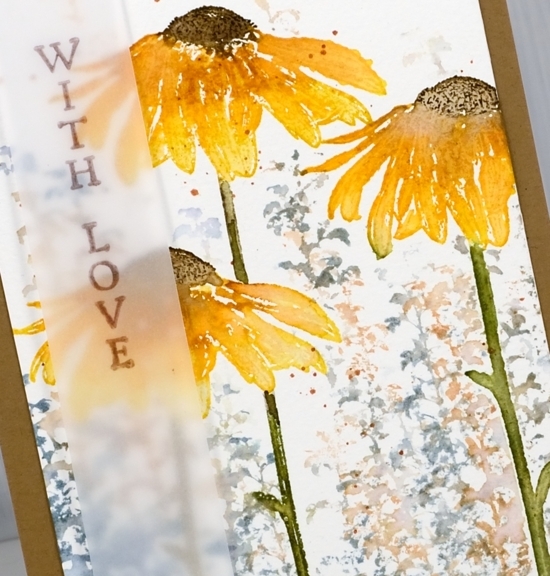 Once the ink had dried I sealed the large flowers and the lettering with distress micro glaze. 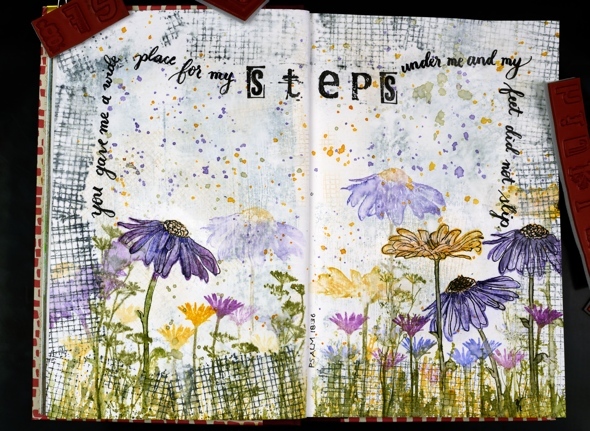 Do you have any art journallers you would recommend for inspiration? 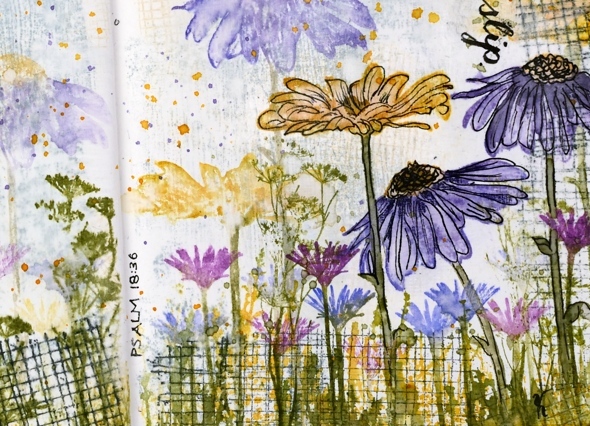 I already follow Rachel Greig from Darkroom Door, Julie Fei-Fan Balzer, Vicky Papaioannou and Maremi SmallArt who all have different styles and inspiring journal pages. I’m hoping to create in my journals more often and will share pages here if possible. 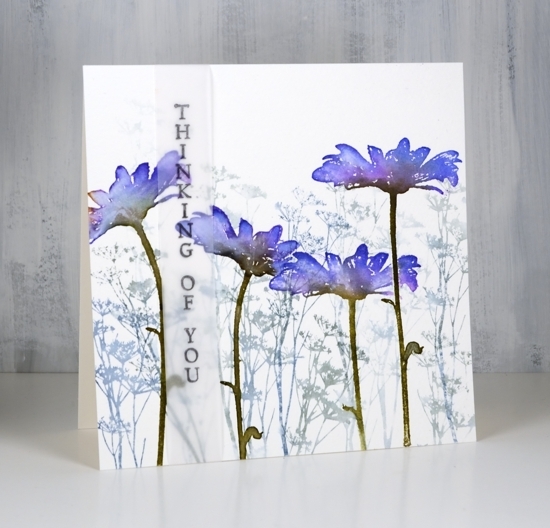 Even if you are not an art journal person the designs can usually be converted to a card and sometimes start out as cards anyway! 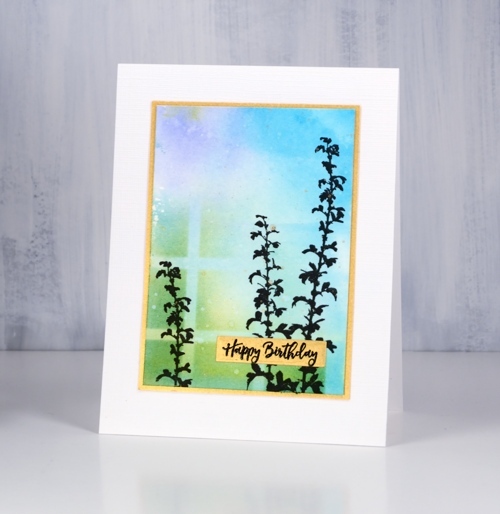 Today’s card features two new brushstroke stamps from Penny Black. The pink flowers in two corners of my panel are from a vase + flowers set called ‘painter’s vase’. 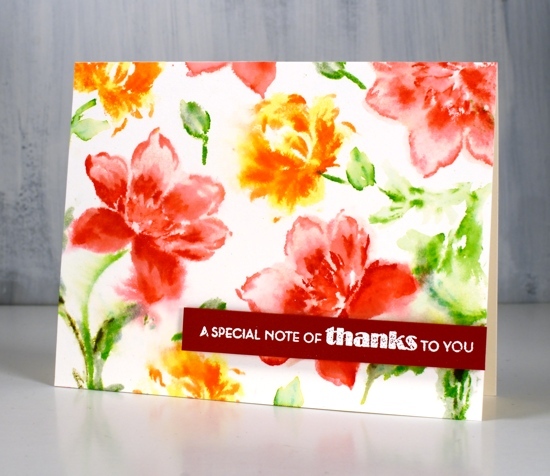 I just used the flower stamp but there is a vase stamp I’ll use another day. 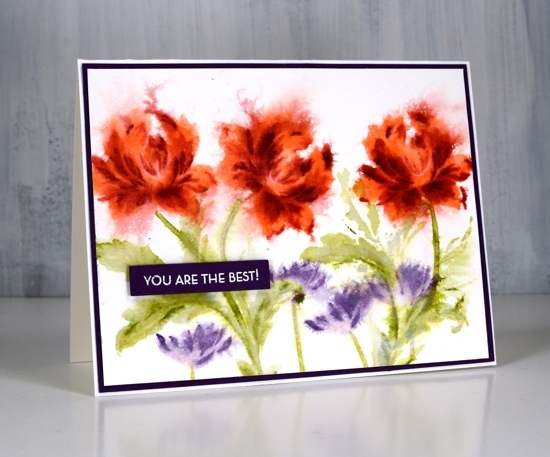 I used my stamp positioning tool (MISTI) and placed the flower stamp overlapping one corner of the hot pressed watercolour panel. I stamped the whole image in worn lipstick distress ink knowing the forest moss ink would be bold enough to cover the pink later. 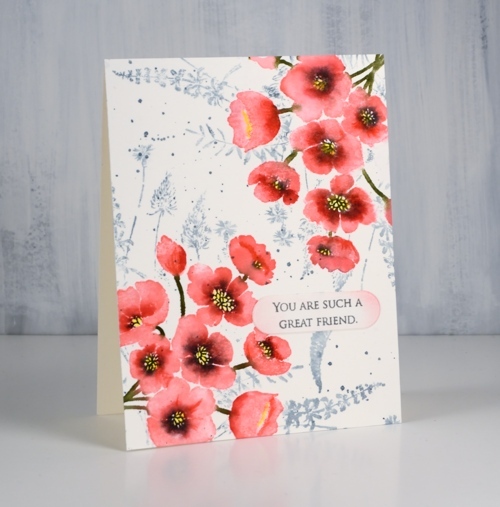 Without moving stamp or panel I inked centres and edges of the flowers with candied apple distress ink, stamped then blended the two pinks with water. 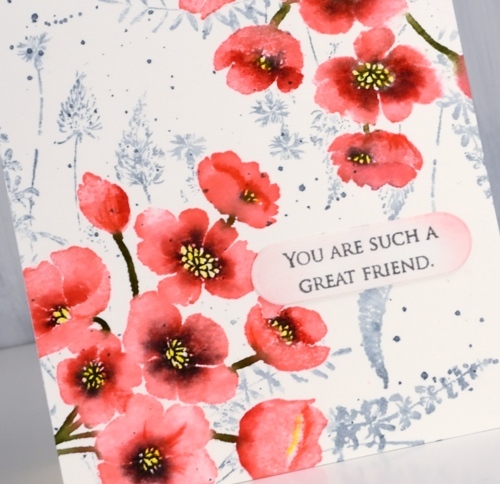 I then added black soot ink to the flower centres, stamped and let the panel dry. 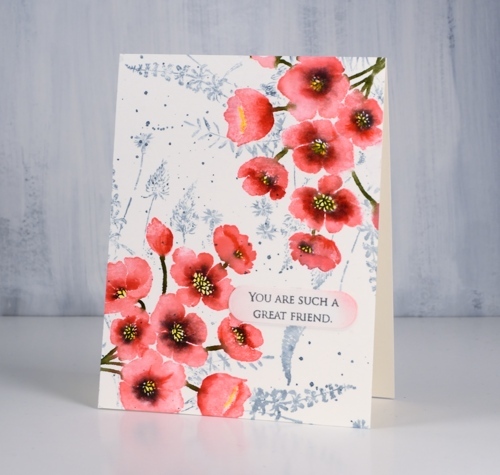 I coloured in the flower centres with a sun yellow inktense pencil and shaded some of the flower centres and edges with poppy red. Then I flipped the panel 180° and repeated the whole process. 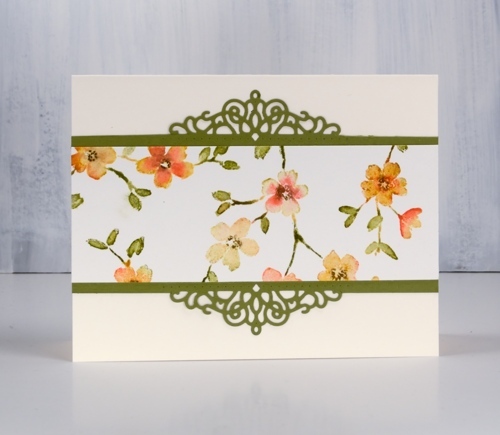 To add a background I had to mask the flowers so I stamped them on masking paper, cut them out and covered my completed corners while I stamped ‘a floral twist‘ stamp in weathered wood distress ink and added a few splatters too. 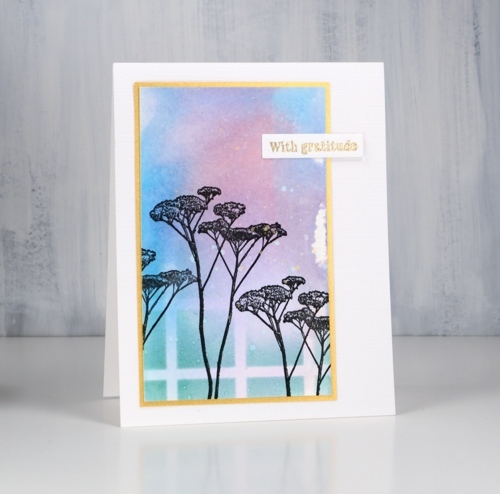 All that was left was to add a sentiment; I decided on something small from ‘grateful sentiments’ on a little die cut label with the edges sponged in worn lipstick ink. 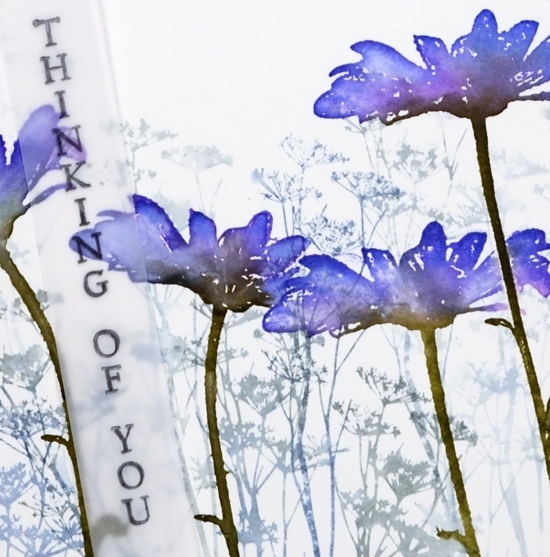 Thanks for dropping by today; it is great to be blogging with a bit of regularity again. 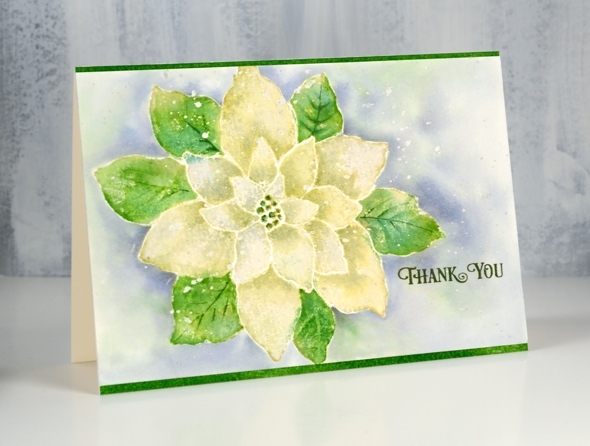 Ever since I received this stamp way back when the weather was warm, I wanted to try it as a ‘white poinsettia’ rather than the traditional red. 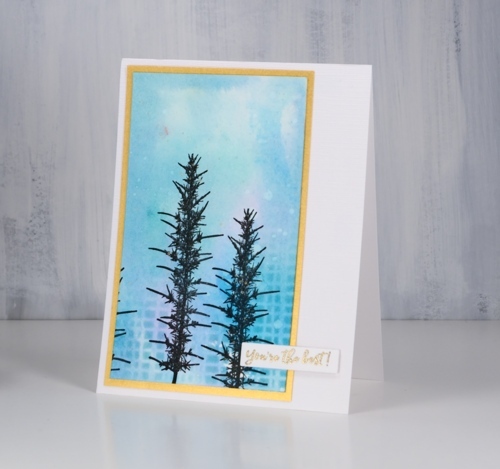 The first card I made with it was red and when I used it in my Christmas class we stamped it red but now as a Christmas thank you I’ve made it white, or to be precise a yellowish, greenish white! 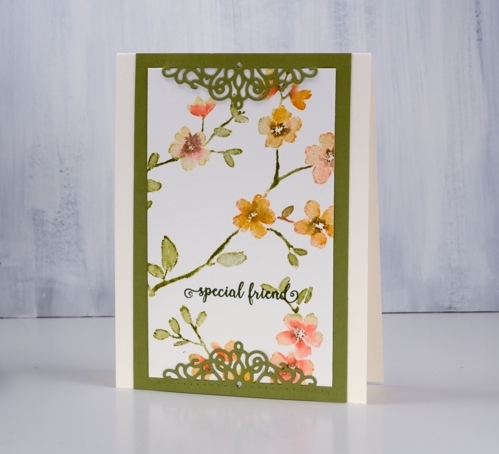 I am sharing it over on the Foiled Fox blog today also. 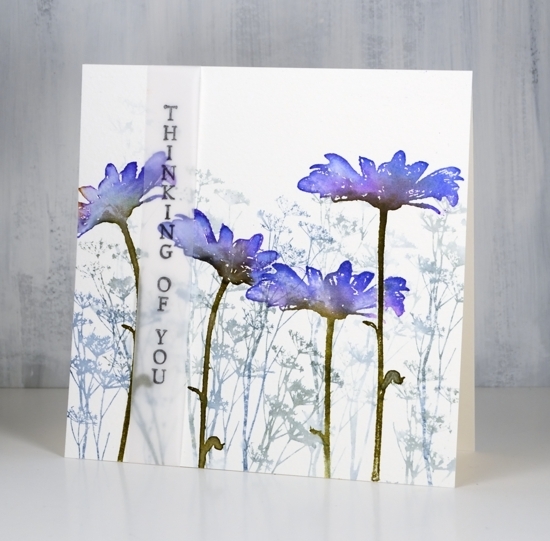 Make sure you pop over there to see enjoy all the beautiful wintry cards they have shared lately. 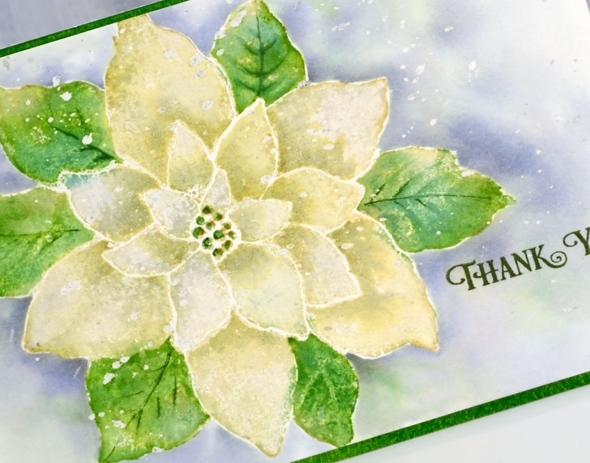 Scroll back to see three gorgeous poinsettia cards made by Shauna Todd posted during December. 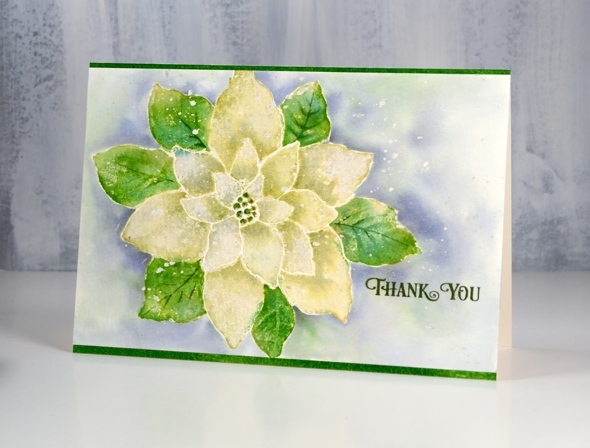 To create my ‘white’ poinsettia I stamped the whole ‘Christmas Red’ stamp from Penny Black in shabby shutters distress ink on hot pressed watercolour paper (which I had splattered with masking fluid earlier). 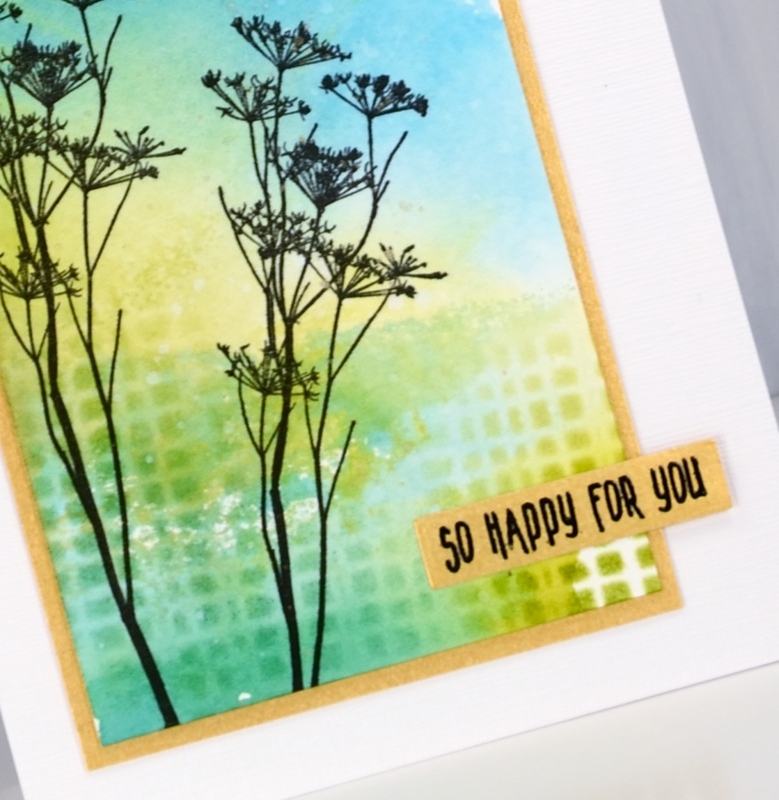 With the stamp in the MISTI I inked the outer leaves with mowed lawn distress ink and stamped again. 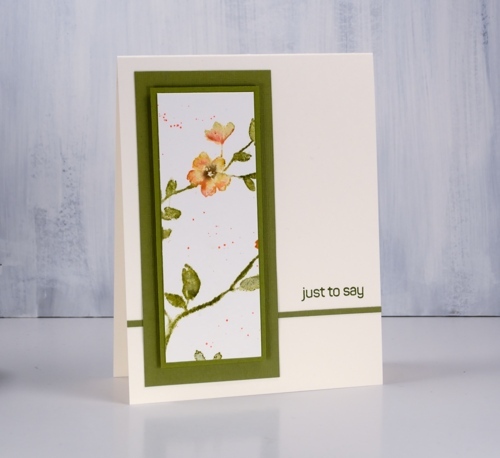 Shabby shutters ink is a pale green to start with so when I diluted it by blending with water I was able to make it a little paler. I blended one petal at a time and dabbed it with a paper towel while it was wet to remove more colour. Before the petals dried I picked up some extra shabby shutters ink off my glass mat and added some shadow where the petals were overlapped by another. 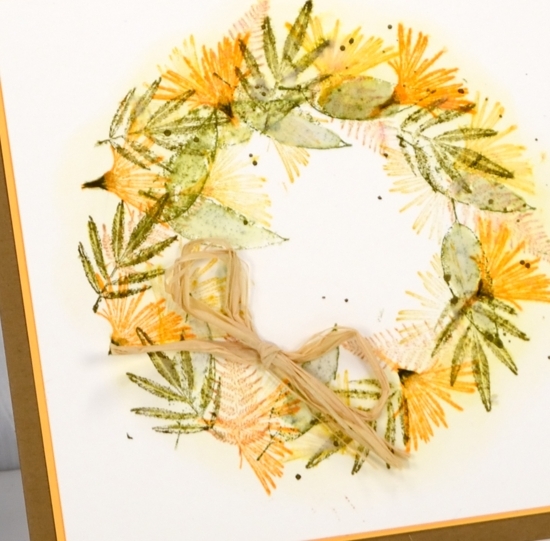 I blended the leaves with water also and when they were dry added some definition with a fine brush and mowed lawn ink. 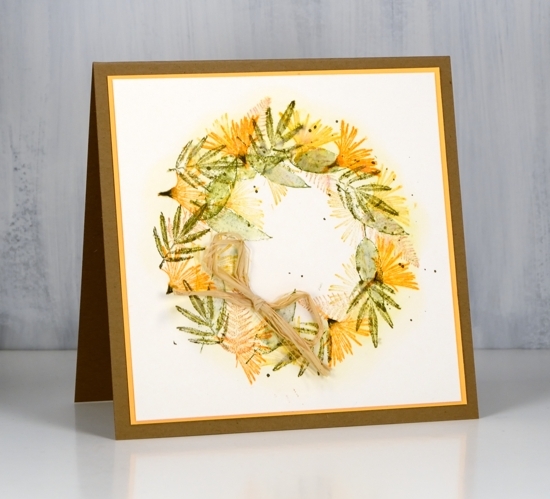 I stamped the centre with mowed lawn ink and added some gold with a wink of stella pen. 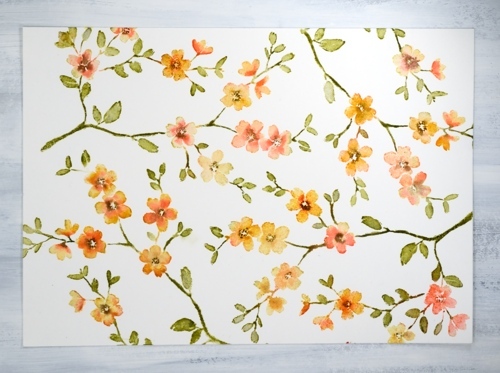 Once the flower was dry I painted around the edges with water then dropped in weathered wood distress stain and blended it to surround the whole image. I also dropped in some green ink here and there while the background painting was wet. 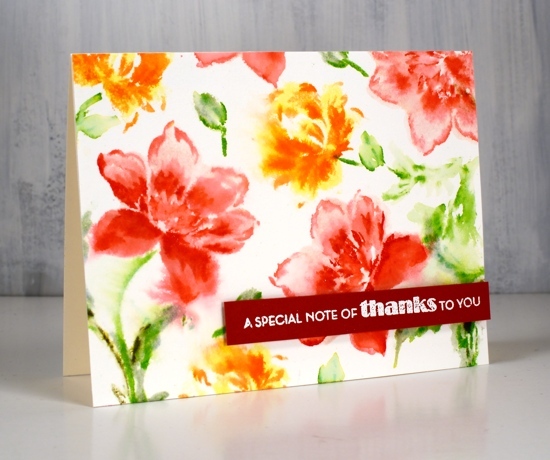 When everything dried I removed the masking fluid and added clear wink of stella to all the petals to give them some shimmer. 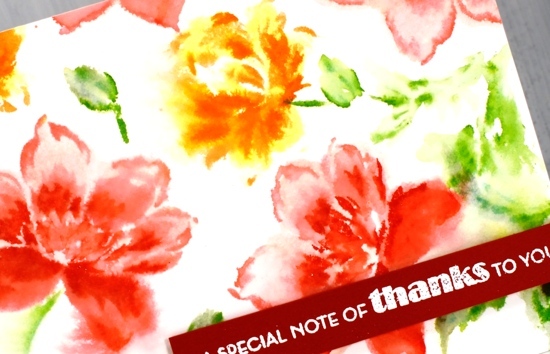 I stamped the ‘thank you’ from the PB ‘banner sentiments’ set in versafine clair shady lane ink. 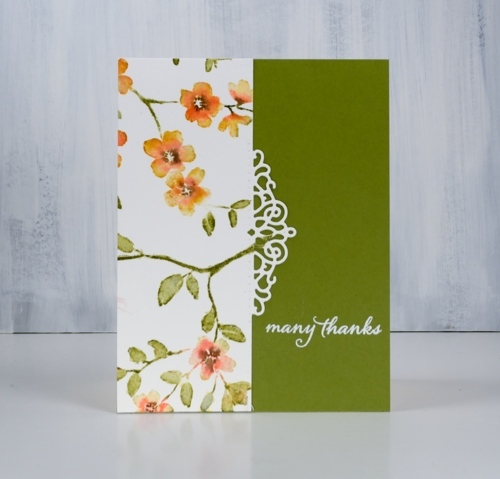 I am very happy to be making thank you cards as I have close to thirty donors to thank so far in my Dressember campaign raising money for the fight against human trafficking. 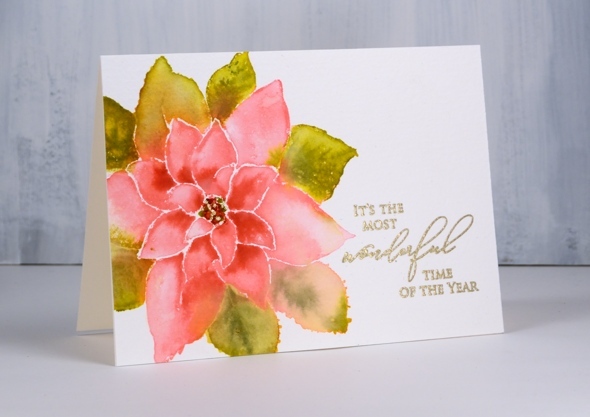 I am adding my pink and green poinsettia to the post just for interest and comparison. 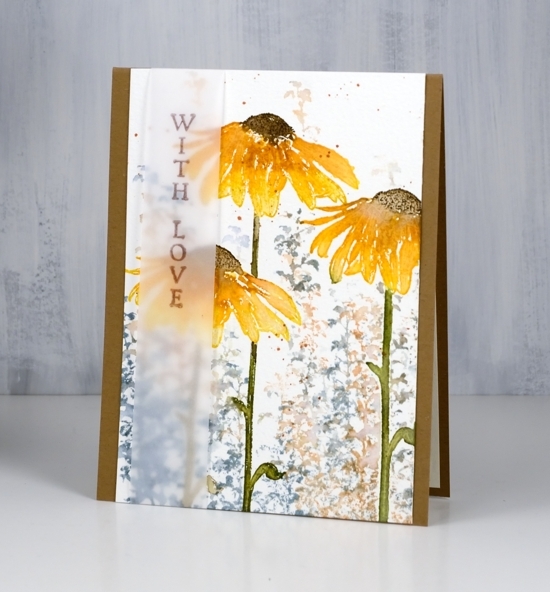 I used a similar process to the one described above but kept the background white as a base from some gold embossing. Thank you for dropping in today.